According to the temperature on my Google homepage, its -5ºF right now. According to Dad, the windchill is -25ºF or somewhere around there. That of course, makes today perfect for a hearty and warm breakfast. There's no better excuse to make oatmeal. I personally am not a big fan of instant oatmeal - though considering the frequency with which I eat them, you can't really tell. I don't like the texture or sweetness (we don't have any regular, Dad bought a big box from Costco). I like to play with my oatmeal, so when it comes with dried fruit and nuts in it already, it throws me off. No to mention the way instant oatmeal triples in size when it hits your stomach. So lying in bed this morning, I decided to make oatmeal. We had fewer bananas than I thought, but it still turned out well. However, I've adjusted the recipe to include the nonexistent banana. In a medium saucepan bring water and salt to a rolling boil. Add oats, reduce heat, and cook for about two minutes. Add molasses and continue cooking, stirring occasionally, about a minute. Add sugar, cinnamon, allspice, and nutmeg, and bananas and continue cooking, stirring occasionally, until thickened, about two to three minutes more. 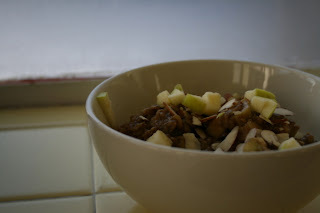 Stir in half of apple and half of almonds. Stir in milk. Divide among three warmed bowls and top with remaining almonds and apple.